Since Bryan Appleyard penned his "The God Wars" article in The New Statesman magazine, the phrase has come to define the cosmic scale of the war between traditional faith based religions and the neo-Atheists such as Richard Dawkins, Sam Harris, Dan Dennet, Lawrence Krauss and the late, great, Christopher Hitchens. Almon McCann, Rob Hyndman, Julia Walman, Paul Davis and myself are representative of neo-Atheist thinking from a Christadelphian background. A movement that was at first thought to be a transitory expression of revolt against religion, has developed into a Galactic War to the death. 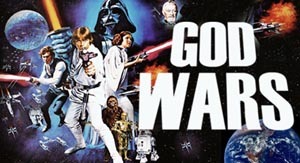 The believers in "The Force" of rational thinking have rallied to the cause of defeating the Evil Empire of faith based religious belief and its malevolent leader God; who, after ruling much of the universe for the past six thousand years, was planning to attack planet Earth and conquer and enslave its inhabitants in his Kingdom, ruled by his cloned son, Christ. tell people how to behave. The poor, submissive, meek subjects of the resulting theocracy are to be put to work building Ezekiel's Temple (Ezekiel Chapter 40) and raising sheep to be offered as burnt offerings to provide aromatherapy for their Evil Emperor. We Christadelphian neo-atheists were late joining the World Rebel Alliance against the Evil Empire. We had spent many years fighting our way out of the Christadelphian cult and we were a long time healing from the shock of our experiences trapped inside their mental prison, where we were brainwashed into thinking that we had "The Truth." But a few years ago, inspired by our first leader, the brave Almon McCann, who founded this website, we began to gather together in virtual groups and fight back against the tyranny of Christadelphian bigotry, dogmatism, ignorance and intolerance that had previously blighted our lives. Like the ragtag army of rejects and discontents who joined David at the cave of Addullam (1 Samuel Chapter 22) our numbers slowly grew until we had a large Facebook Group, many different websites and page view numbers that propelled us onto the front page of Google searches for the word "Christadelphian." - This website is now #7 out of 318,000 results! Despite the success of our attack, the expected Christadelphian counter attack has never materialised. 1 Peter 3:15 instructs believers to:"be ready always to give an answer to every man that asketh you a reason of the hope that is in you"
But the Christadelphians decide to ignore this, as they ignore most everything else in the Bible, and to not open up with their big guns to attempt to silence their critics who were demanding to see some credible evidence for their invisible God. Apart from banning some of us from their websites, they have mostly continued to worry about knitting woolly jumpers for Jewish Relief, determining the precise moment when the cloth covering the emblems should be removed at the memorial service, whether or not applause should be allowed at baptisms and other matters that they consider to be more important than the fact that their troops are defecting to the Christadelphian Atheists and Ex-Christadelphians. They have not even begun to undertake a defence of their theistic position by coming up with some empirical evidence that their beneficent God, who is supposed to have flattened Jericho, exists. They have not attempted to explain why the guy who created the universe can't be bothered to appear on the Oprah show to proclaim his reality, or to assist Dr Phil to guide people how to live their lives correctly. They are at a loss to explain why he does not trouble to show up at the United Nations debates on serious world issues, to handle our problems and to allow us to give him respect and honour for his wisdom and altruistic attitude. Above all they won't answer our challenge that their God appears to act in ways that are indistinguishable from his non-existence. 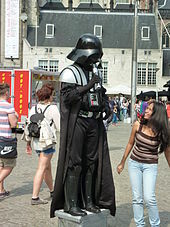 I suggest that the time has come for individual Christadelphian Storm Troopers, who feel let down by their weak leaders and disappointed by their inability to respond to our arguments, to negotiate with us the possibility of switching sides. 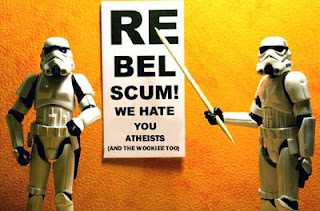 Why waste your lives supporting a group that stands for anti-science, isolationist, elitist, exclusive, judgemental, self-righteous, Nineteenth Century Anglo-American religious bigotry; when you could instead be working with us rebels to discover what really makes this awesome universe tick?